Greenhouse Winery is a small winery near North Huntingdon (Irwin), Pennsylvania that specializes in Pennsylvania wines, accessories and gifts. They originally had a very basic Google Sites website which really didn’t drive much, if any, traffic to their single store at the time. 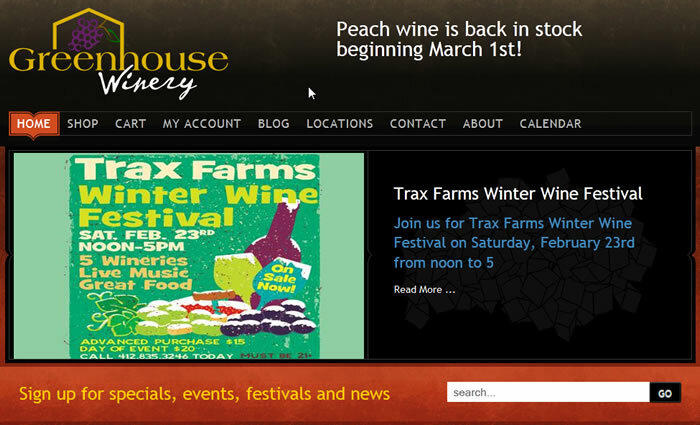 With our help, Greenhouse Winery has added two additional stores, an e-commerce store, and a mall kiosk. We used email marketing, Search Engine Optimization and Social Media Management to increase their traffic and let people know about their great wines, specials and events.